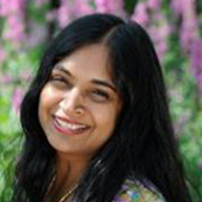 She is the founder & CEO of Bhavna’s Wellness Group in Shrewsbury, Massachusetts, USA. She has an MBA from NY specializing in Banking & Finance, Bachelor from Delhi University. Her calling to serve, empower, inspire, awaken and heal has led her in creating the Wellness Center. /sexual abuse and much more. She is a compassionate & powerfully strong leader, courageous, honest being with integrity and love for all. Her vision is to create a holistic center with the collaboration of like-minded beings all over the world to create balance in mind, body, heart & soul. Her mission is to provide help to women, children and seniors to have basic life necessities along with education and medical treatments. She works with many non-profits, missionaries, shelters, schools in U.S, Guatemala and India providing support to them. She is being called and looked by people as a Great Being here to awaken the Consciousness of Love & peace. She is an exemplar of force of spreading love & Peace within the hearts of all those she connects with.